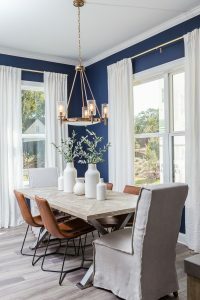 This Edward Andrews community is located at the crossroads of Kirkwood, East Lake and Oakhurst, making Bixton a fresh, stylish and playful place to connect. Bixton was designed to create a sense of place with front porches that neighbors like to visit with one another on, street lights and walkability. This is a place to live, enjoy and soak up the neighborhood. The model home is the Alder plan, a 2,400+-square-foot home with three bedrooms and three-and-a-half baths. Residents will enjoy an oversized family room opening to a full porch, along with additional living and entertainment space in the separate dining room or flex room. An added design feature, oak treads run throughout the home, and ample storage and parking can be found in the two-car garage. For more information, visit Bixton. This enclave of 12 townhomes features timeless architecture to honor the heritage of the area. Walkable to the Marietta Square, this Traton Homes neighborhood features a fenced dog park and pool memberships are available at nearby North Square. The Registry at Marietta Square offers three-story townhomes with finished terrace levels and two-car rear-load garages with elevator options available. The decorated model is a Glover home plan. The home’s brick exterior and rich gray shutters provide a welcome to guests as they arrive at the front porch that opens to a foyer on the terrace level. 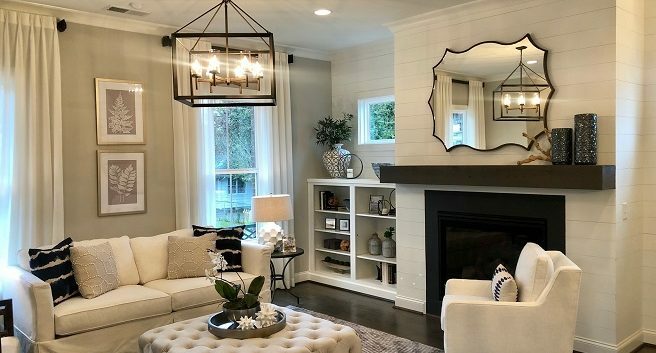 Home details that residents love include a spacious family room with a fireplace and covered deck, perfect for entertaining, as well as the large dining area and kitchen. The kitchen is designed for cooking with a huge island, farmhouse sink, quartz countertops, gas cooktop, double oven and stainless-steel appliances. The upper level of the home includes the owner’s suite with walk in closet, and a luxurious bathroom with tile throughout, shower and freestanding tub. For more information, visit The Registry at Marietta Square. 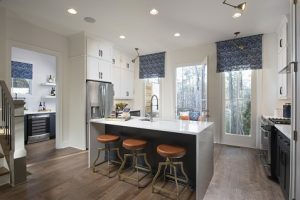 Located close to Chastain Park in North Buckhead is Amble Green, an intimate community from Monte Hewett Homes of 30 single-family homes nestled among tree lined streets. The community is bordered on one side by Nancy Creek and the other by the Blue Heron Nature Preserve. Designed in a contemporary transitional style, homes at Amble Green offer eye-catching exteriors, and high-end luxury appointments such as standard including quartz countertops, custom cabinetry, Jenn-Aire stainless steel appliances and elevator options. The Woodland home plan is the model home. With 3,755 square feet of living space, this home boasts four bedrooms, three-and-a-half baths, a covered terrace, two-car garage and optional elevator. Highlights of this beautiful model include a contemporary kitchen with an oversized walnut island with six-centimeter quartz countertop with waterfall legs, while upper walnut cabinets are paired with crisp white slab base cabinets and antique brass pulls. A covered rooftop terrace loggia is complete with a fireplace, Coyote grill and refrigerator – perfect for entertaining guests or a relaxing night with someone special. The third level offers the ultimate owner’s suite retreat with his and hers walk-in closets and a spa-like bath with contemporary, under-lit dual vanities made of white oak with a Calacatta marble subway tile backsplash, private water closet and separate shower and soaking tub. For more information, visit Amble Green online. Mason Main offers open-concept townhome designs and a walkable lifestyle. 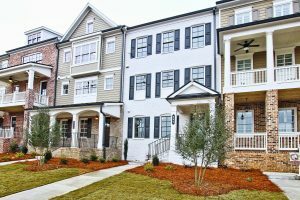 Located in the highly sought-after location of Woodstock, Georgia, Mason Main is comprised of 57 low-maintenance townhomes. Community amenities include pocket parks throughout and HOA-maintained lawn care and landscaping. Residents enjoy walkability to the many shopping, dining and entertainment options found in downtown Woodstock. The Providence Group showcases the three-story Fletcher home design as the community’s model home. This plan features a variety of customizable options that include an elevator and flex spaces. Offering approximately 2,500 square feet of living space, the Fletcher model boasts four bedrooms, three-and-a-half baths and a front-entry, two-car garage. The main level offers seamless connectivity between the family room, dining space and gourmet kitchen with oversized island, plenty of counterspace and access to the rear deck. 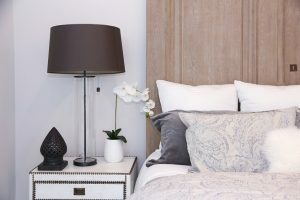 The luxurious owner’s suite serves as an ultimate third floor retreat, with an impressive walk-in closet with custom shelving and a spa-like bath with dual vanities and massive shower featuring dual showerheads. For more information, visit Mason Main online. Traton Homes’ Smyrna community, The Grove at Adams Pond, features 55 detached two-story homes with an option for a third floor. These homes are perfect for buyers who need more space. The community boasts amazing amenities that connect residents with nature and their neighbors – a community lake, firepit and pocket park. And, best of all, this community is walkable to Smyrna Market Village! 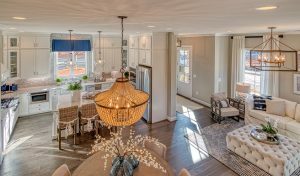 The Taylor model home is the decorated model at this community. With a beautiful Charleston-inspired elevation complete with a covered porch, crisp white paint and dark grey shutters, this home turns heads. A crisp coastal feel flows through the home from the open family room with a shiplap feature wall, grey tile backsplash in the kitchen with a pattern reminiscent of waves and touches of blue throughout. Hardwood floors provide a warm feeling throughout the main level. A mudroom provides places to hang coats and hats, as well as access to the garage and rear porch. The second floor offers a large owner’s suite with a spa-like bath featuring a spacious walk-in closet, oversized shower and freestanding tub. The second floor can be configured for three or four bedrooms depending on the buyer’s preference. The Taylor’s optional third floor can be finished with a media room and additional bedroom and bath if desired. The model home showcases a third-floor secret room and a huge media room for relaxing and entertaining. For more information, visit The Grove at Adams Pond. Get outside and enjoy the sunshine while touring model homes this spring. You’ll get to see some beautiful neighborhoods while taking in the blossoming trees, budding flowers and green, green grass popping up all over town. Feel free to comment once you complete your tour and let us know your favorite model home!